As a professor, I strive for excellence both as a competent scholar within the discipline of church history, and as a capable communicator and guide to learning in the classroom. I have a particular passion for helping students to think critically about their faith experience without becoming cynical, to historicize their church tradition without discrediting it, and to recognize the symbiotic relationship in the life of the church between cultural/human forces and the work of the Holy Spirit. Especially satisfying for me are teaching experiences in which professor and students learn from each other, and where learners begin to “see differently” and thereby apprehend a fuller understanding of Christian faith and practice. As a Christian, I strive to support my role as a professor by living a life characterized by integrity, honesty, joy, faithfulness in Christian disciplines (worship, prayer and witness), holiness and humility. In 1999, Bruce Guenther became the first MBBS faculty appointment within the ACTS consortium at Trinity Western University (Langley, BC). After graduating from Winnipeg Bible College (now Providence College) in 1982, he worked as a staff worker with InterVarsity Christian Fellowship in Saskatchewan for four years. The ministry with IVCF nurtured a broader intellectual interest, which led to further education at both Regent College in Vancouver and McGill University in Montreal. Prior to coming to MBBS at ACTS Bruce taught as a sessional lecturer in numerous schools including Briercrest Seminary, St. Andrew’s College, University of Saskatchewan, Bethany Bible Institute and McGill University. In addition to his educational credentials and ministry experience, Bruce brings a variety of unique interests, life experience and skills to his position including time spent as a camp director, free-lance writer and researcher, and a farmer. During the past decade he has been actively involved as a lay person in several Mennonite Brethren churches as well as in the larger political arena. 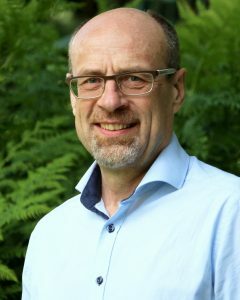 Although his initial understanding of the Mennonite story was shaped by his early childhood and adolescent experience as a part of an Old Colony Mennonite family, it was his entry into the Mennonite Brethren denomination in 1994 that helped nurture a keen interest in understanding the evangelical-Anabaptist identity of the denomination. He has been married to Lois Guenther since 1982; they have three children who are full of life and fun: Cameron (born in 1988), Karyn (born in 1989) and Kyle (born in 1994). History of evangelicalism and fundamentalism; history of theological education in Canada; Mennonite history; Christianity and culture.